Researchers at University of Surrrey has developed the world’s first sneezeometer using an airflow sensor that is sensitive enough to measure the speed of sneeze to help diagnose diverse respiratory conditions twice as fast. The current devices are expensive and lack sensitivy in difficult diagnostic situations. Surrey’s sneezometer is ultra-sensitive and measures the flow rate of air through a patient’s lungs. The sneezometer is fast and sensitive enough to pick up tiny fluctuations int he breath’s flow rate when the patient breathes through the instrument. After the development of the Surrey’s sneezometer, researchers are currently exploring its diagnostic capabilities. According to Dr. Birch from University of Surrey’s Aerodynamics and Environmental Flow research Group explained, “Breathing disorders are highly prevalent in both the developed and developing world”. The diagnosis and monitoring of respiratory diseases is crucial to proper treatment. This sneezometer that has been developed is a simple, low-cost and non-intrusive diagnostic solution that will make doctors’ lives easier. The device is currently used in clinical trials at King’s College Hospital in London to help develop a wide range conditions from neonatal settings through to animal diseases. The ability to monitor the sensitivity of airflow detection makes this very useful for both research and clinical perspective. Surrey’s researchers envisions that the new device could be in clinical service as soon as 2018 and will have a true impact on the lives of patience living with chronic illnesses. The device will make the diagnosis more accurate, faster, and cheaper. Carbon nanotubes (CNTs) have been found in cells extracted from the airways of Parisian children under routine treatment for asthma, according to a report in the journal EBioMedicine (open access) by scientists in France and atRice University. The cells were taken from 69 randomly selected asthma patients aged 2 to 17 who underwent routine fiber-optic bronchoscopies as part of their treatment. The researchers analyzed particulate matter found in the alveolar macrophage cells (also known as dust cells), which help stop foreign materials like particles and bacteria from entering the lungs. The study partially answers the question of what makes up the black material inside alveolar macrophages, the original focus of the study. The researchers found single-walled and multiwalled carbon nanotubes and amorphous carbon among the cells. The nanotube aggregates in the cells ranged in size from 10 to 60 nanometers in diameter and up to several hundred nanometers in length, small enough that optical microscopes would not have been able to identify them in samples from former patients. The new study used more sophisticated tools, including high-resolution transmission electron microscopy, X-ray spectroscopy, Raman spectroscopy, and near-infrared fluorescence microscopy to definitively identify them in the cells and in the environmental samples. The researchers also suggested previous studies that link the carbon content of airway macrophages and the decline of lung function should be reconsidered in light of the new findings. The researchers also suggested that the large surface areas of nanotubes and their ability to adhere to substances may make them effective carriers for other pollutants. Carbon nanotubes from forest fires and cars? However, similar nanotubes have been found in samples from the exhaust pipes of Paris vehicles, in dust gathered from various places around the city, in spider webs in India, and even in ice cores, the paper notes. A car’s catalytic converter, which turns toxic carbon monoxide into safer emissions, bears at least a passing resemblance to the Rice-invented high-pressure carbon monoxide, or HiPco, process to make carbon nanotubes, he said. “So it is not a big surprise, when you think about it,” Wilson said. For ethical reasons, no cells from healthy patients were analyzed, but because nanotubes were found in all of the samples, the study led the researchers to conclude that carbon nanotubes are likely to be found in everybody. “It’s kind of ironic. In our laboratory, working with carbon nanotubes, we wear facemasks to prevent exactly what we’re seeing in these samples, yet everyone walking around out there in the world probably has at least a small concentration of carbon nanotubes in their lungs,” he said. The study followed one released by Rice and Baylor College of Medicine earlier this month with the similar goal ofanalyzing the black substance found in the lungs of smokers who died of emphysema. That study found carbon black nanoparticles that were the product of the incomplete combustion of such organic material as tobacco. Co-authors are from Paris-Saclay University, the Paediatric Pulmonology and Allergy Center and the Department of Anatomo-Pathology of the Groupe hospitalier La Roche-Guyon, and Paris Diderot University. 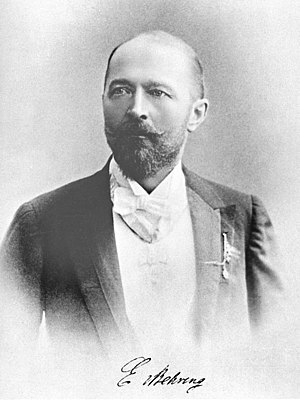 The Welch Foundation partially supported the research. Compelling evidence shows that fine particulate matters (PM) from air pollution penetrate lower airways and are associated with adverse health effects even within concentrations below those recommended by the WHO. A paper reported a dose-dependent link between carbon content in alveolar macrophages (assessed only by optical microscopy) and the decline in lung function. However, to the best of our knowledge, PM had never been accurately characterized inside human lung cells and the most responsible components of the particulate mix are still unknown. On another hand carbon nanotubes (CNTs) from natural and anthropogenic sources might be an important component of PM in both indoor and outdoor air. We used high-resolution transmission electron microscopy and energy dispersive X-ray spectroscopy to characterize PM present in broncho-alveolar lavage-fluids (n = 64) and inside lung cells (n = 5 patients) of asthmatic children. We show that inhaled PM mostly consist of CNTs. 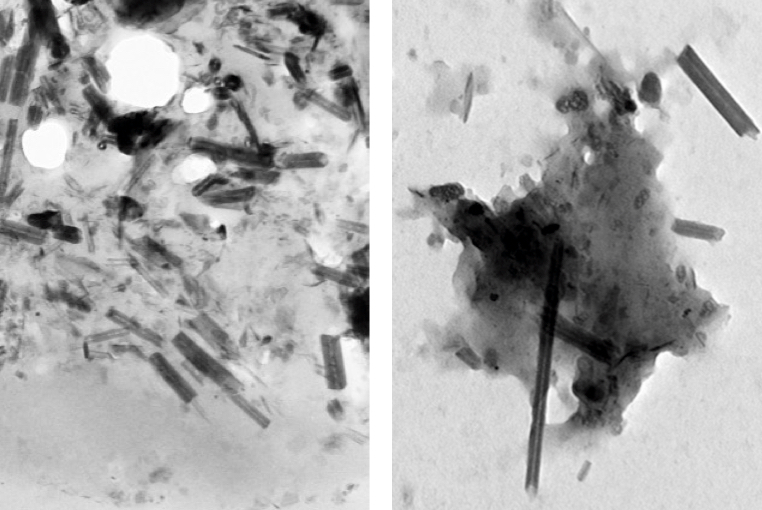 These CNTs are present in all examined samples and they are similar to those we found in dusts and vehicle exhausts collected in Paris, as well as to those previously characterized in ambient air in the USA, in spider webs in India, and in ice core. These results strongly suggest that humans are routinely exposed to CNTs. Are cars nanotubes factories on wheels? we are also poised to learn more about the role of cytokines and other molecules in the pathophysiology of asthma. resources, and significant adverse effects. Novel biologic therapeutics are being developed for the treatment of asthma and are of potential use for severe refractory asthma, especially where the increased cost of such agents is more likely justified. This review will briefly summarize what is meant by “biologic therapies” and then highlight recent published data on efficacy and safety of these therapies for asthma. while the remaining 95% of the antibody is molecularly replaced by human sequences. 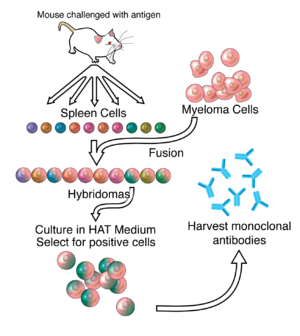 In the latest approach, fully human antibodies (“umabs” such as adalimumab) can be created by using phage display technology and molecular biology or more directly by immunizing mice that have had their immunoglobulin genes replaced with human versions. 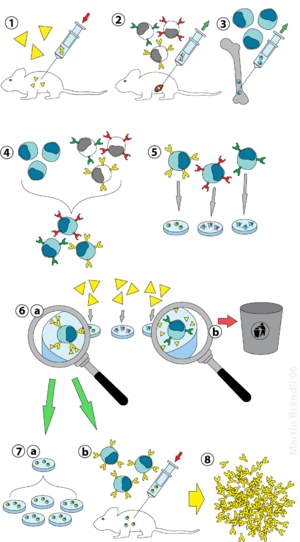 Newer artificial antibody structures such as bispecific antibodies, mix 2 separate arms with 2 different binding specificities to target 2 different types of antigens [eg, a single antibody where one arm binds interleukin (IL)-4 and the other arm binds IL-13]. Standard nomenclature for mAbs identifies their source with the last 4 or 5 letters: -omab, murine: –ximab, chimeric: -zumab, humanized: and –umab, human. The middle part of the name reflects the disease indication for which the mAb was initially intended: -lim for immune and inflammatory diseases, -cir for cardiovascular disorders, and -tu for tumors or neoplastic conditions. The first 3 or 4 letters may be chosen by the sponsor. Modified (by adding the structure of a bispecific antibody) . In general, FDA-approved mAbs have emerged between 10 and 12 years after the date that the new technologies on which they were based were reported in the scientific literature. None of these newer antibody structures have been tried in asthma, so the remainder of this review will focus on available data with standard biologicals. It induces the IgE isotype switch and up-regulates expression of vascular cell adhesion molecule-1 on endothelium and a variety of TH2 chemokines, thus promoting recruitment of T lymphocytes, monocytes, basophils, and eosinophils to sites of allergic inflammation. 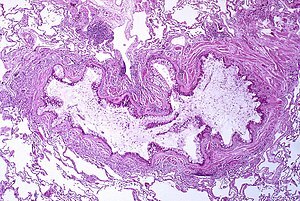 A clinical trial studied the soluble recombinant human IL-4 receptor (IL-4R), Nuvance in asthma. Nuvance inhibited a decline in FEV1 during inhaled corticosteroid withdrawal and was overall well tolerated.2,3 However, in subsequent clinical trials in patients taking only beta agonist, soluble IL-4R failed to demonstrate significant clinical efficacy. A phase I randomized double blind placebo controlled study evaluated the effects of pascolizumab, a humanized anti-IL-4 antibody, in 24 patients with mild to moderate asthma. Pascolizumab was well tolerated and no serious adverse events occurred.5 However, a phase IIa clinical trial in steroid-naive, mild to moderate asthmatics, did not demonstrate clinical efficacy. Because the IL-4 targeting studies have failed to demonstrate clinical efficacy, one can justify concluding that either IL-4R is not an effective therapeutic target in asthma. 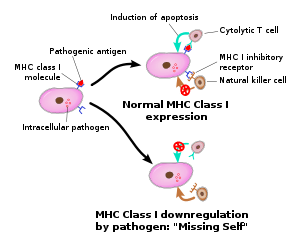 Tumor necrosis factor (TNF) is a multifunctional proinflammatory cytokine produced by inflammatory cells including monocytes, macrophages, mast cells, smooth muscle cells, and epithelial cells. TNF may initiate airway inflammation by up-regulating adhesion molecules, mucin hypersecretion, and airway remodeling, and by synergizing with TH2 cytokines. Berry et al demonstrated that severe refractory asthmatics have evidence of up-regulation of TNF as compared with healthy controls and mild asthmatics. Entanercept was evaluated in a small, randomized, double-blind placebo-controlled crossover study in 10 patients with severe refractory asthma and elevated TNF levels, 10 patients with mild to moderate asthma, and 10 control patients. Entanercept treatment was associated with improved FEV1, asthma related quality of life, and the concentration of methacholine needed to provoke a 20% decrease in FEV1. No serious adverse reactions were noted. In another double-blind, placebo-controlled, parallel group study, 38 patients with moderate asthma on inhaled corticosteroids were treated with infliximab. Although infliximab treatment did not improve the primary end point of morning peak expiratory flow, it decreased diurnal variation of the peak expiratory flow rate and asthma exacerbations. No serious adverse events were noted. Golimumab was recently evaluated in the largest randomized, double-blind, placebo-controlled study in 309 patients with severe, uncontrolled asthma. No significant differences were observed for the change in FEV1 or exacerbations. However, several serious adverse events occurred. There is no clear role for TNF in perpetuating asthma or asthma exacerbations. CD4 T cells are likely to be involved as a source of proinflammatory cytokines in asthma. Keliximab is a monoclonal antibody that causes a transient reduction in the number of CD4 T cells. A double blind, randomized, placebo controlled study with 22 severe oral corticosteroid dependent asthmatics patients was completed. A subset of patients received the highest dose of keliximab (3.0 mg/kg). There was significant improvement of peak expiratory flow rates in the high dose treatment arm. However, CD4 T cells remained transiently reduced 14 days postinfusion, raising safety concerns. 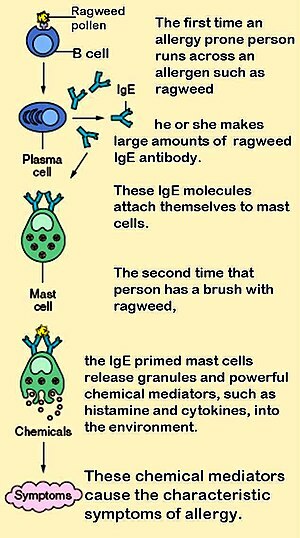 which can lead to mast cell degranulation. IDEC-152 caused a dose-dependent reduction in serum IgE concentrations. Airway inflammation is associated with activated CD25 T cells, IL-2, and soluble IL-2 receptors. Daclizumab is a humanized monoclonal antibody directed against the alpha subunit of the high affinity IL-2 receptor (CD25). This inhibits IL-2 binding and release of inflammatory cytokines. A randomized, double-blind, placebo-controlled, parallel group study was performed (115 patients, 88 to the treatment arm, 27 to placebo)to evaluate the efficacy of daclizumab in patients with moderate to severe asthma poorly controlled on inhaled corticosteroids. Treatment with daclizumab led to improvements in FEV1, daytime asthma symptoms, and rescue 2 agonist use,but the effects were modest. Omalizumab is a humanized monoclonal anti-IgE antibody that binds free circulating IgE and prevents the interaction between IgE and high affinity (FcRI) and low affinity (FcRII) IgE receptors on inflammatory cells. Omalizumab also down-regulates the surface expression of FcRI on basophils, mast cells, and dendritic cells. Omalizumab decreases free IgE levels and reduces FcRI receptor expression on mast cells and basophils. This results in decreased mast cell activation and sensitivity, leading to a reduction in eosinophil influx and activation. Anti-IgE treatment with omalizumab might result in decreased mast cell survival. Omalizumab also reduces dendritic cell FcRI receptor expression. The primary end point in a phase III randomized prospective trial was the number of exacerbation episodes during the steroid reduction period and the stable steroid period. During the stable steroid phase, fewer omalizumab subjects than placebo subjects experienced one or more exacerbations (14.6 vs. 23.3%; P  0.009). During the steroid reduction phase, the omalizumab group had fewer subjects with exacerbations (21.3 vs. 32.3%; P  0.04). The median reduction in inhaled corticosteroid dose was significantly greater in the omalizumab group than in the placebo group (75 vs. 50%; P  0.001). The efficacy of omalizumab was demonstrated in other clinical trials including INNOVATE. INNOVATE was a double-blind, parallel-group study in which 419 subjects were randomized to receive omalizumab or placebo for 28 weeks. The omalizumab group had a 26% reduction in the rate of clinically significant exacerbations compared with placebo (.68 vs. .91, P  0.042). A recent omalizumab observational study of 280 subjects demonstrates similar findings. After 6 months, they found a reduction in daily symptoms by 80%, nocturnal symptoms by 86%, asthma exacerbations by 82%, hospitalizations by 76%, unscheduled health care visits by 81%, and improvement in quality of life (Mini Asthma Quality of Life Questionnaire increased from 2.9 to 4.5 after 6 months of treatment). Examining the effects of biologic agents provides unique and valuable insight into the pathobiology of asthma. Furthermore, it is an ideal opportunity to identify mechanisms inherent to severe refractory asthma. The development of biologic agents has been a slow and arduous process; however, a substantial amount of progress has been achieved. Although omalizumab is an expensive medical treatment, therapy may be cost effective in patients with uncontrolled severe persistent allergic asthma because the majority of the economic burden is in this population. Hopefully ongoing efforts with biologicals will lead to improved management options for our most severe asthma patients.